This guitar has it all: classic looks, quality build, excellent playability, evocative sounds acoustically and plugged in, and an ultra-keen price. What's not to like? Simple beauty. Sonic personality. Fuss-free operation. Great price. It's no surprise that these guitars have long been associated with acoustic blues and other uncomplicated music forms - their no-nonsense vibe and relatively unsophisticated voice make them the perfect complement to moody ballads or raunchy work songs. We recently reviewed Martin's own wonderful M-series instruments, which gained high praise and converted many players to the 'brown sound'. However, we've also looked at Sigma's own laminated versions in the past, and one of these has become an office favourite - often used as a gauge against which acoustics at all price points are judged. So, it was with great anticipation that we received this all-solid instrument with onboard electronics. Built in Korea, it broadly sits between those venerable Martins and their own humbler siblings, but with a spec sheet that makes one scratch the chin and ask: how on earth do they do it for the price? 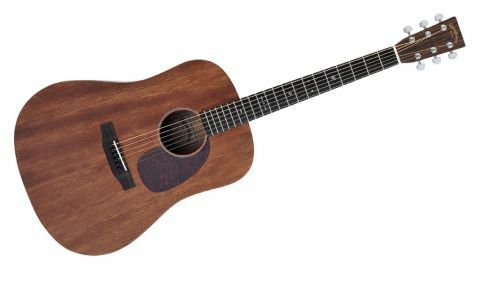 In a timeless classic Dreadnought design it appears to offer something to satisfy the needs of many a blues, folk or bluegrass picker or strummer. The droopy- shouldered SDM-15 looks, at first glance, like the plainest of Janes. But in fact, its style is both simple and elegant. The dark-stained mahogany of the top, back, sides and neck, striped rosewood headstock veneer plus pitch-black ebony fingerboard and bridge offer little instant reward for the eyes. Spend a little time, though; look closer, and the guitar begins to exude its own special beauty. "Spend a little time; look closer, and the guitar begins to exude its own special beauty"
Although completely unbound - either round the body or along the 20-fret 'board - the five-ply soundhole ring adds subtle decoration. And so simple is the look that the silver frets, white bone nut and saddle, mottled brown pickguard, chrome Grover tuners and gold Sigma logo, adopt the secondary role of added ornamentation. Surprisingly, but itself a subtle nicety, Sigma has chosen to adorn the fingerboard with 42-style abalone snowflake inlays. In dark pink and green shell with flashes of gun-metal silver, they offer welcome respite from the sea of matt brown and black, adding a welcome touch of visual class, and managing not to look out of place in the otherwise meagre surroundings. Built from solid mahogany all round - no laminates showing around the unbound edges (always a give-away on cheaper guitars of this type) - another happy discovery is that, while the neck does feature tell-tale joins halfway up the heel, there's no messy-looking scarf joint at the headstock. Instead, Sigma has gone to the trouble of including diamond volutes, just like on much more expensive Martin and Martin-derived instruments. The smell of the guitar gives away the fact that it is finished in polyester and not nitrocellulose. That said, it's certainly not smothered in the stuff - for instance, there's no unsightly build-up around the dovetailed neck joint - and overall, the look is anything but plastic-y. In fact, the subtle graining of the mahogany glows beautifully through the matt, as opposed to hiding behind a sea of shiny reflections, which would be the case with a gloss finish. The grain pattern is sure to vary from instrument to instrument, so shop around and choose one that you like. Strung with Martin strings, the action is medium to low, and the neck is shaped to give the player no surprises in the performance department, offering a manageable handful yet still feeling modern, with minimum fattening from nut to heel. Open chords and 1st-position licks fall deftly under the fingers, while moving up the neck for barre chords and other musings requires no huge effort. The compensated bone saddle means intonation is as good as it gets on an acoustic, and should you choose to tune to an open chord and pick up a bottleneck, the string tension from the 645mm (25.4-inch) scale length is enough to make this a relatively rattle-free experience. "There's something about the sound of all-mahogany guitars that's incredibly appealing"
There's something about the sound of all-mahogany guitars that's incredibly appealing. True, they lack the frequency range, finesse and tonal transparency of a quality rosewood and spruce model, but it's these very limitations that give the 'instruments' such purpose as bluegrass, folk or country-blues guitars. Dreadnoughts are among the best all-rounders, so whether it's used as a basher of chords, for the odd solo or with a capo for fingerpicked accompaniments, the SDM-15 passes muster on all counts. While it doesn't exactly brim with sophistication, it's a wholesome voice that matches the guitar's appearance - earthy, rich and dark. With volume and tone controls mounted ready for a fingertip's brush within the upper rim of the soundhole, Fishman's popular Sonitone under-saddle transducer and built-in preamp is a no-nonsense solution to amplifying the Sigmas. The system's inherent sound is honest and uncomplicated, with very little of that intrusive piezo 'ping', and controls that are intuitive and offer enough tone tailoring to suit any straightforward live situation. Some players want everything on the guitar; others want as little as possible. This reviewer is in the latter camp: nothing cleverer is required. It's worth a quick reminder that this guitar is a solid mahogany construction, with a quality neck, real ebony fingerboard and bridge, bone nut and compensated bone saddle, chrome Grover tuners and abalone inlays. It also features a Fishman Sonitone pickup and preamp system with soundhole volume and tone controls and comes in a decent-quality padded gigbag. All that for just £499 - it's a very persuasive prospect. Should you be looking for a bluesy belter or general all-round acoustic, then the SDM-15 is the no-brainer of all no-brainers. It's got the power to do the business acoustically, and if you require more volume, simply plug into the PA or a small acoustic amp and the onboard Fishman system will provide ballsy backup. It's very hard to find a downside here. Given its remit, as an instrument providing a certain style and sound within a competitive market at perhaps the most aggressive price point, it not only hits the bullseye, but splits the arrow down the centre with the next shot. When we consider what was available just a few years ago for this relatively affordable amount of money, we have to ask again: how do they do it? And while we can't be entirely sure of the answer, what we can say is that we're mighty glad that they do.